The first line of kings lasted for 249 years, until the ninth king Helm Hammerhand. In T.A. 2758, Rohan was invaded by Dunlendings under Wulf, son of Freca, of mixed Dunland and Rohan blood. 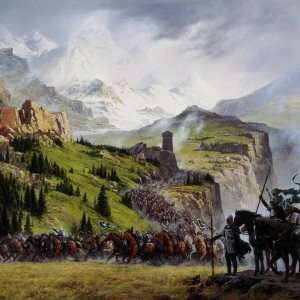 The King, Helm Hammerhand, took refuge in the Hornburg until reinforcements from Gondor and Dunharrow (a refuge of the Rohirrim) arrived a year later and defeated the invaders. 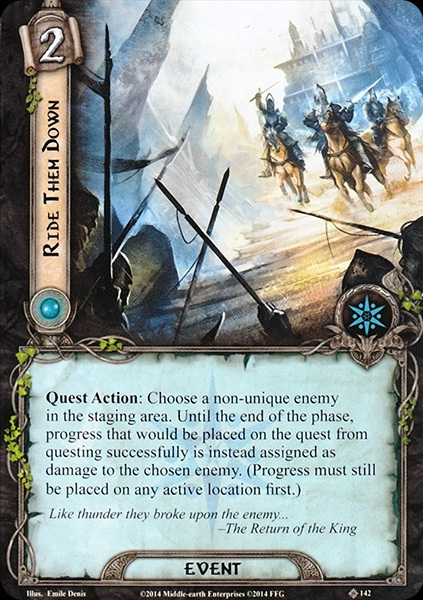 In a daring raid Fréaláfrecaptured Edoras, and managed to reclaim it. He eventually drove the Dunlendings back across the rivers Isen and Adorn, freeing all of Rohan. The rule of the Stewards of Gondor was now over. King Éomer and the new king of Gondor, Aragorn II (Aragorn), renewed their oath of alliance, and reaffirmed Cirion's grant of Calenardhon to the Rohirrim. But though Sauron had perished Éomer often fulfilled the Oath of Eorl and went with King Elessar far into the East and South. He was known as Éomer Éadig, or 'the Blessed', because during his reign Rohan recovered from the hurts of the War and became a rich and fruitful land again. At the time of the War of the Ring, Rohan was roughly a third the size of Gondor, whose borders had slowly been shrinking for decades. 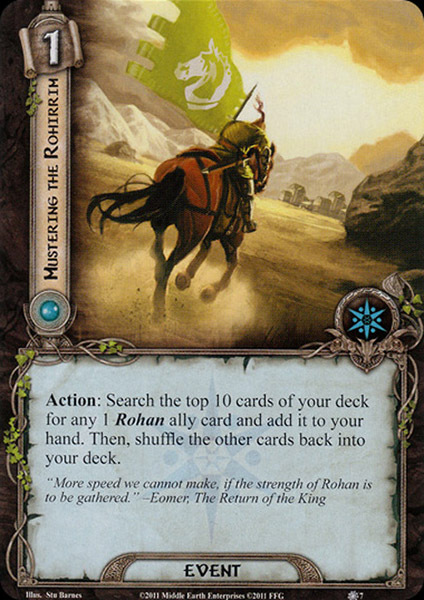 The countryside of Rohan was described as a land of pastures and lush tall grassland. 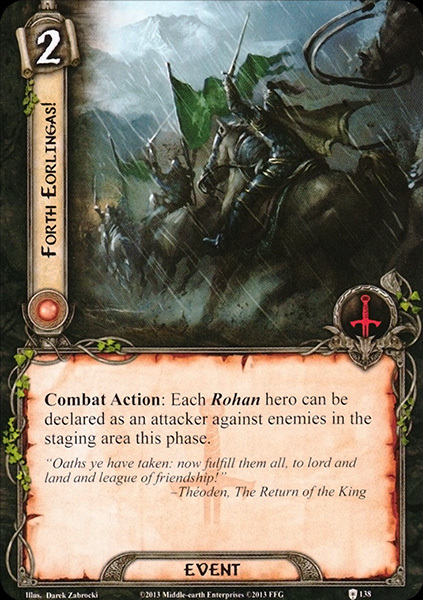 The lands of Rohan are frequently described as appearing like 'seas of grass'. Most of the Rohirrim dwelt in small villages or farms. When king Théoden began to grow old, he took as an advisor Gríma, later called Wormtongue. Gríma quickly became Théoden's chief advisor, but unknown to all he was secretly working for Saruman. Gríma played on Théoden's fears to further weaken the strength of the king and all of Rohan, always advising retreat where an attack was needed. He may have also begun poisoning the king at this time. This nearly proved disastrous for Rohan, and also for Gondor, by robbing them of their strongest ally in the north. Gríma Wormtongue's plans were not revealed until Gandalf arrived in Edoras during the War of the Ring. 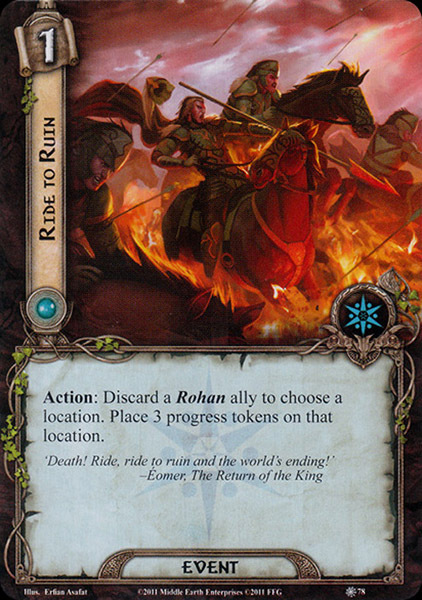 The name Rohan (coined by Hallas) is Gondor Sindarin, meaning 'Horse-country'. 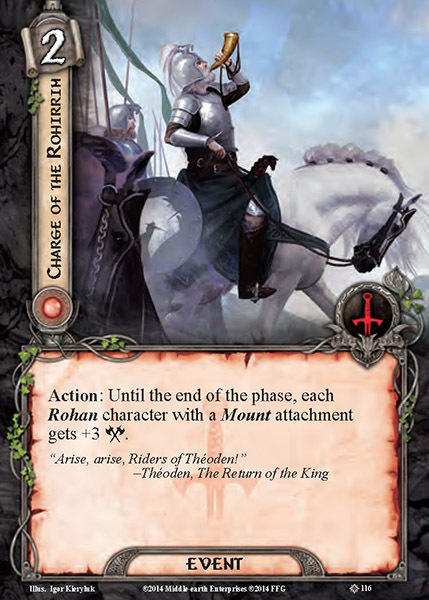 Rohan is a debased form of the proper Sindarin name Rochand (or Rochan), containing the elements roch ('horse') and the toponymical ending -and. Conceptualized as the 'Horse kings of Rohan' allied with Mordor in early drafts of 1939, the Rohirrim took their final form in 1942 when the text of the Lord of the Rings was completed to about one third.